Perhaps the most remote location for a piece of scientific equipment, the South Col will now be home to the world's highest weather station. This week, the MacGillivray Freeman Films Everest IMAX/IWERKS Format Science Expedition will be installing a weather station at 26,000 feet on Everest. 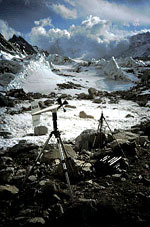 This station, brought to Base Camp and set up by geophysicist Roger Bilham of the University of Colorado, will be placed on snow and ice and embedded in a deep pile of stone to withstand the high winds on the South Col. The station is equipped to measure temperature, barometric pressure, and wind speed. NOVA: What is this gadget we're looking at? BILHAM: We've got a weather package here that's been tested for extreme conditions. Specially built for Mt. Everest, it is designed to function reliably at minus 55 degrees centigrade, and under wind stresses of 150 mph. We're actually not monitoring many parameters. There are three separate temperature probes designed to tell us about air temperatures and temperatures closer to the ground. We have a solar radiometer that measures the radiation coming to the earth from space. Of course, at sea level, a radiometer will tell you about all the stuff in between you and space. But at the top of Mt Everest there isn't much between you and space, so it's a very reliable measure of what the sun's pushing out. In fact there are particles of dust floating over Everest, so it's quite interesting to see what's there. And the other two sensors are wind direction and wind speed. With an anemometer, the propeller thing flops around and points in the direction of the wind. Now the package is interesting because it was put specially together by Campbell Scientific, one of our best manufacturers of these things, and what they've done is they've got a black box here, which was switched on a couple of months ago in Boulder, Colorado and will operate for 3 years. So it's now measuring temperature at Base Camp, and as it goes up the mountain it will measure temperature along the way and when it's sitting on the South Col it will be measuring temperature and other parameters. The whole business of predicting the weather depends on knowing how much water vapor there is in the atmosphere and where the winds are going, what the pressure conditions are, and what the temperature conditions are throughout the whole troposphere. Photos: (1) courtesy Robert Schauer; (2-3) courtesy Roger Bilham.